In a totally unique way The Butterfly Stool blends Eastern shapes with the technique developed by Charles and Ray Eames of shaping plywood. The gently curved silhouette is reminiscent of the wings of a butterfly. 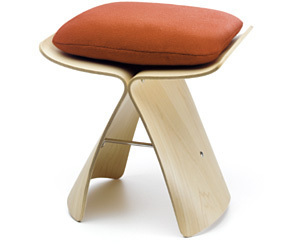 The Butterfly Stool comes in two sizes designed by Sori Yanagi, and there is also a matching cushion. Collection Vitra Design Museum. Laquered moulded plywood, brass fixings. Click here to go back to "Vitra Furniture"